Over the last few years, we have made many investments in Azure to help you deploy Microsoft applications into the public cloud in an easy and safe way, a Cloud First approach to your application plans. AzureCon, just last week, was an exciting opportunity to talk about some of the latest improvements we have made in this area, including Windows Server console output, the Azure Security Center, GA of Azure File Storage, and Azure ExpressRoute connectivity for Office 365 and Skype for Business. These announcements are a continuation to a long list of features and policies we have built so you can easily use the agility and scale of the Azure cloud for Microsoft apps. The following are just a few examples of customers who are deploying Microsoft Apps in Azure: GE Healthcare, BlinkBox, Toyota, Lufthansa, Telenor, Tel Aviv Municipality, City of Seattle, Chronodrive, Serko, and Saab. One of the biggest benefits deploying on Azure is the ease of getting started. We strive to combine the agility that comes with instantaneous infrastructure with fast application deployment and configuration. To make this really easy, we have built solutions to deploy complex applications in simple ways, with many more options than any other cloud provider. SharePoint 2013 – Just last week, with the support of the SharePoint product team, we released a 9-VM Highly Available SharePoint farm deployment into the marketplace, using SharePoint, SQL Server AlwaysOn, and Windows Server images (for Active Directory), following the best practices defined by the SharePoint team. This complements our existing 3-VM solution. Both use DSC and Azure extension technology to deploy SharePoint seamlessly. You can even take a look at the templates and expand them in any way you choose in our growing GitHub repository. SQL Server – Similar to SharePoint, the Azure marketplace contains a plethora of fast deployment options for SQL Server. The marketplace offers 25 different options across multiple versions, Service Pack levels, and product levels (Enterprise/Standard/Web) to get you started as fast as possible including pre-release versions of SQL Server 2016. The marketplace also offers a single click multi-VM SQL Server AlwaysOn HA deployment. These have been built and configured by the SQL Server team to reduce your start-up time and minimize misconfigurations from doing it yourself or having a 3rd-party cloud create the images. These images deploy using Premium Storage, by default, in order to maximize performance on Azure VMs. 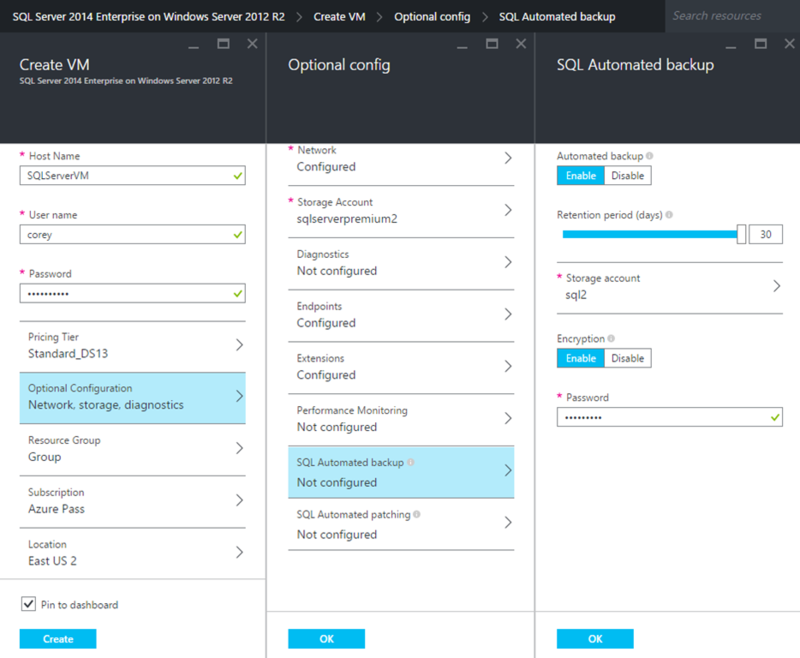 In addition to automated deployment, SQL Server running in Azure Virtual Machines come with a set of automated management capabilities. This includes configuring automated patching, SQL-specific diagnostics, and automated backup (with encryption) as part of VM deployment. All of these combined make Azure the best cloud to run SQL Server. Azure SQL Database – In addition to the support for running SQL Server on a VM, the Azure platform also supports a fully managed SQL database, offering the latest SQL Server functionality and high availability (99.99% SLA) with self-healing, automated failovers, and geo-replication. Dynamics AX – In order to simplify and standardize Azure deployments of Dynamics AX, the Dynamics team built the Microsoft Dynamics Lifecycle Services (LCS), an Azure-based portal that helps you deploy, update, and manage the full lifecycle of a Dynamics AX 2012 implementation. Going far beyond simple deployment, unlike any other cloud solution, LCS enables you to identity, define, and design full AX solutions to deploy. Dynamics NAV/GP – Dynamics NAV 2015 and Dynamics GP 2013 R2 have images available to easily deploy from the marketplace, pre-configured and ready for your usage. Like SQL and SharePoint, these images are built by Dynamics engineers, using the best practices as defined by Dynamics engineers. BizTalk Server – BizTalk Server has a set of six images available built by the BizTalk team, for you to get started fast, following the best practices of BizTalk Server. HPC Pack – The Azure marketplace also has pre-configured HPC Pack 2012 R2 images ready for deployment and usage, coupled with powerful QuickStart templates stored in GitHub. Additional Windows-Based Templates – In addition to the above deployment solutions, Azure has a growing community of more than 160 deployment templates across more than 110 contributors, many configuring solutions on Windows Server like creating a DSC pull server, deploying IIS, launching Chef on Windows, Puppet on Windows, creating HPC clusters, and configuring WinRM. You can find this large repository in QuickStart Templates and hosted in GitHub. Hybrid IT is the reality for many customers deploying in the cloud and Microsoft Azure offers a comprehensive hybrid story for customers to deploy their solutions in both the public cloud and in private/hosted clouds, including an ever growing ExpressRoute partner ecosystem, offering global connectivity; however, this connectivity is only the beginning. The below points outline a few examples of connected services and solutions that make Azure the best place to run Microsoft applications with a hybrid infrastructure. SQL Server Stretch Database — One of the more exciting capabilities offered in SQL Server 2016 (currently in CTP2) is called a Stretch Database. With Stretch Databases, when running a SQL Server, historical data can be stored in an Azure SQL Database, offering lower costs and reducing complexity to archive data without having to change the application. More details can be found here. Azure Site Recovery – An Azure hybrid offering enabling site-to-site and on-premises to Azure disaster recovery that can replicate from Hyper-V or VMware-based instances. Given the deep support for Microsoft applications, Azure Site Recovery is the only supported hybrid disaster recovery technology for Microsoft applications including SharePoint, Dynamics AX, Exchange 2013, SQL Server, and IIS applications. This unique offering with Azure creates a differentiated hybrid experience for Microsoft customers. More details can be found here. Azure ExpressRoute and Office 365 – As announced last week, Azure ExpressRoute offers the most complete hybrid story, connecting your on-premises deployments with applications in Azure and Office 365, soon adding CRM Online. ExpressRoute provides private, high performance, high throughput, and secure connectivity to Microsoft cloud services. 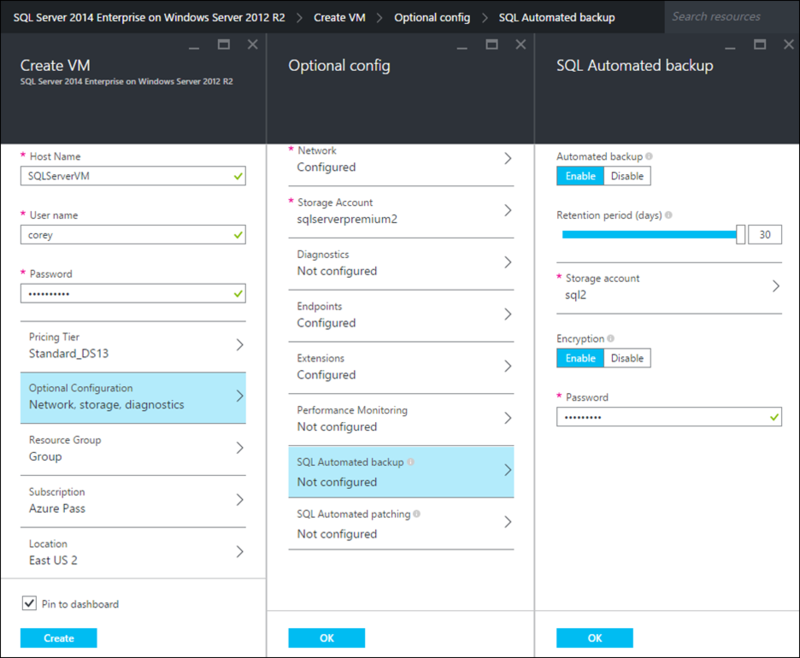 SQL Server Backups and AlwaysOn Secondaries – SQL Server instances, whether on-premises or in Azure, offer Microsoft Azure storage as a backup destination, enabling flexible, reliable and nearly limitless off-site storage. With backup to Azure, you can simplify your backup and restore policies with point-in-time restore from Azure Blob snapshots and even encrypt the backups for additional security using the Azure Key Vault. More details can be found here. In addition to hosting SQL Server Backups in Azure, you can also deploy an AlwaysOn replica directly into Azure for direct DR with a read-only replica, taking advantage of the agile compute offered in Azure. Azure Active Directory Connect – Azure Active Directory is the single identity connecting all Microsoft cloud solutions, including Azure, Office 365, and Dynamics CRM Online. With Azure Active Directory Connect, you can sign on with a common and synchronized hybrid identity across on-premises and cloud, connecting Windows Server Active Directory and Azure Active Directory identities in hybrid environments. More details can be found here. Azure is the only public cloud provider that can offer one-stop enterprise support for your entire technology stack, from infrastructure, on Azure Virtual Machines, to Microsoft application across your full hybrid deployment. This includes a very large selection of Microsoft applications, including BizTalk Server, Dynamics AX, Dynamics CRM, Dynamics GP, Dynamics NAV, Microsoft Exchange, Microsoft Forefront Identity Manager, Microsoft Project Server, Microsoft SharePoint Server, SQL Server, System Center, and Team Foundation Server. The entire list of supported applications and versions can be found here. One of the easiest ways to get started on the public cloud is with Dev/Test solutions and Azure offers the best Dev/Test experiences for Microsoft applications. On Azure, you can deploy any software covered by your MSDN subscription for Dev/Test purposes, with no additional charge. This includes SharePoint, SQL, Exchange, and many more. More details on the MSDN benefits running Microsoft applications on Azure can be found here. Furthermore, for MSDN subscribers, we have created a set of pre-configured VM images to enable really agile development and testing on Azure, including Windows 8.1 Enterprise, Windows 7 Enterprise, Windows 10 Enterprise, and a wide variety of Visual Studio Ultimate and Professional images, all discounted to the price of the infrastructure. You can find the entire list of MSDN images available here. Finally, in addition to the above product and technical solutions to deploy Microsoft applications in Azure, we also enable simple License Mobility of popular Microsoft products like SharePoint and SQL Server from on-premises into Azure. For those customers who have Software Assurance with Microsoft, you have the flexibility to deploy eligible applications on Azure without purchasing new licenses, as described in detail here. Extending our support to Bring Your Own Licenses (BYOL) to Azure, we are now making it possible for you to bring your existing Windows Server licenses to Azure. Learn more about this new Azure benefit here. Across product deployment, management, dev/test, and licensing, Azure uniquely offers the best cloud for deploying Microsoft applications. Furthermore, with the numerous hybrid solutions and offerings, you can span your deployments between on-premises and Azure with added benefits like cloud-based backup, disaster recovery, and database stretching. I hope the above gives you some ideas for possible deployments on Azure VMs and continues to show our commitment to truly offering a Cloud First experience for our customers running Microsoft applications.